PT Wijaya Karya Realty (Wika Realty), a subsidiary of PT Wijaya Karya (Persero) Tbk., Ensuring Tamansari Lagoon project in the city of Manado, North Sulawesi, will be completed on time. Tamansari Lagoon is a mixed-use project that summarizes the apartment building, condotel and commercial. That's because this time the Tamansari Lagoon project has entered the stage of topping off (closing the roof). 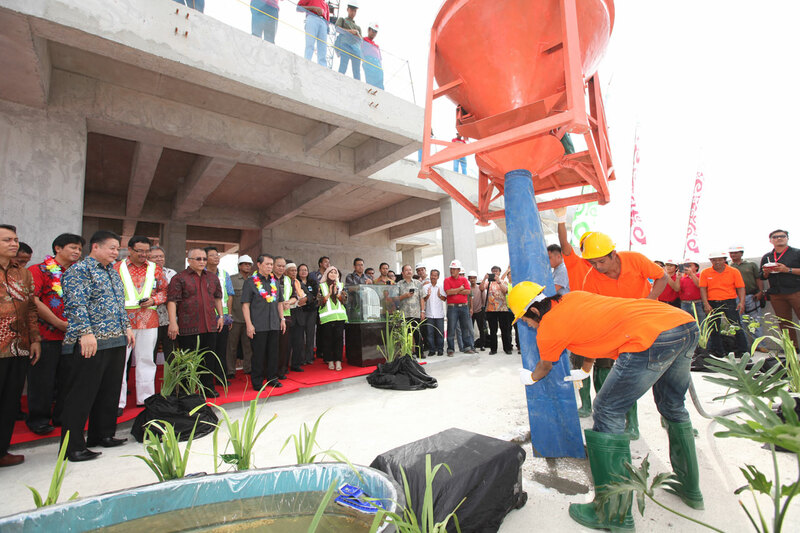 Once the structure is completed stages, Tamansari Lagoon development will enter the finishing stages. The procession was attended by topping off in addition to the management of PT Wika Realty namely Director of PT Wika Realty, Budi Saddewa Soediro and Realty Manager Tamansari Lagoon, Ugik Sugiyanto, also attended by the management of PT Philadelphia Family Blessing the President Director of PT Philadelphia Blessing Family, Titus Handojo. Projects built with an investment of Rp 200 billion, this is the result of cooperation between PT Wika Realty and PT Philadelphia Blessing Family. "Tamansari Lagoon we plan to begin to be handed over in January 2015," said Budi Saddewa Soediro, President Director of PT Wika Realty. Since launching at the end of 2012, Tamansari Lagoon responded very well by the market. This was evidenced by the results of the current sales has reached 65% for a total of 183 units of apartments, and 40% of the total 187 condotel units. "We are optimistic that this year could be all sold out," said Ugik Sugiyanto, Manager of Realty Tamansari Lagoon. Ugik further explained, Tamansari Lagoon buyer profile consists of businessmen, doctors, employees, contractors and nearly 50% of buyers are businessmen. "Buyers Tamansari Lagoon majority of the people of Manado ie 64%, then the rest coming from Jakarta, Surabaya, Samarinda, Maluku, Bitung, Kotamobagu, Sangihe and some areas around the city of Manado. While the composition of end users around 55% and 45% of investors. How to pay KPA most widely used, about 46%, then approximately 36% Incremental Cash, Hard Cash then the rest, "said Ugik. For apartments, consisting of 5 types namely Studio, 1 Bedroom, 2 Bedroom, 3 Bedroom and Penthouse are marketed with prices starting at Rp 600 million (Include VAT). While the condotel is composed of two types namely Studio and 1 Bedroom / suite types are marketed with prices starting at 950 millions (Include VAT). Ugik said, since marketed until now there are 12 times the price increases in the range of ± 80% of the total increase of the initial price when launching. "This project future investment prospects are very promising, in terms of apartment or condotel. For there Condotel rental guarantee / ROI of 16% fixed for 2 years and no more extra promo for all units is 100% Payback, "said Ugik. Tamansari Lagoon which will be The Most Stylish Living Place in Manado built on an area of ? ?2,500 m2 on the road Wolter Manginsidi No. 1, Manado, precisely in the CBD Shoulder Mall that comes with shopping malls, hospitals, and international schools. To meet trends and lifestyle needs of today, Tamansari Lagoon offers a modern design and stylish building, complete with a variety of convenience facilities that can be accessed in a building just by using the elevator. Consists of 28 floors, Tamansari Lagoon will be the tallest building and even the prettiest in Manado in North Sulawesi. No exaggeration when predicted will soon become a new icon in Manado. The location is very strategic and Tamansari Lagoon which is located in the attractive coastal Shoulder which is the central place for a variety of recreational activities, entertainment, business, shopping, and lifestyle point in the city of Manado. "Residents will be spoiled with spectacular 360 degree views, stunning from all sides of the building. View of the beach and ocean are beautiful, the glitter of the city of Manado, or the beauty of the mountains, the beauty of the sunset and sunrise, can be enjoyed every day, every year from every window in this building, "said Ugik. Tamansari Lagoon is equipped with various facilities including Romanico Wedding Terrace, Dynamic Lagoon Pool, The Breze Stylish Bar, Flying Resto, Lagoon Al-Freshco, Spa & Salon, Mini Market, Fitness Centre, Laundry, and others. Tamansari Lagoon offers the best of modern apartments in Manado which is a reflection of the cosmopolitan lifestyle that is synonymous with practicality, ease and completeness of the facilities and comfort in one area of ? ?the building. Equipped with a range of quality facilities make it as a dwelling classy, well-known, prestigious and high. The facilities include a smart card system, fabulous lobby, cable tv and internet systems, and others. In addition to apartments, Tamansari Lagoon also offers a condotel. "Manado is a city of tourism, business, and metropolitan, which continues to grow. It is characterized by the many tourists who make Manado as a favorite destination for tourism in eastern Indonesia. Surely this will lead to increased demand for hotel rooms in Manado from year to year has increased significantly, "said Ugik. Seeing a golden opportunity that continues to rise, says Ugik, it's time investors have a favorable star hotel room is to purchase Condotel Tamansari Lagoon with income greater than deposits. Kondotel Tamansari Lagoon will be operated by Best Western International, the largest hotel chain in the world providing marketing support, reservations and operational to more than 4,100 member hotels are independently owned and operated in 100 countries and territories around the world. As one of the hospitality industry pioneer since 1946, Best Western International has rapidly developed into an iconic brand which hosts 400,000 guests each night. While the commercial area with an area of over 1000 m2 will consist of a drug store, boutique, mini market, Fitnes Center, Salon & Spa and Laundry.